A product of the area’s extensive experience in craftsmanship and innovation, Asheville’s advanced manufacturing cluster is anything but old-school. Stemming from the artisan handcrafts perfected during the time of the Vanderbilts, our manufacturers today are shaping a new era of technically advanced skills across a diverse range of high-growth industries. From metalworking, to textiles and precision cutting tools, our modern manufacturing workforce is laser-focused on crafting quality products that we’re proud to say are made right here in Western North Carolina. Home to hundreds of manufactures of all sizes, job opportunities, workforce training programs and cross-industry collaboration within the community are on the rise. This supportive environment, along with Asheville’s favorable economic climate, continue to attract manufacturing giants like GE Aviation and Linamar Corporation, making Buncombe County a global competitor in today’s advanced technologies marketplace. Learn more about the focus of our high-tech manufacturing efforts below. Asheville has proved itself as a world leader in air and spacecraft production. A legacy employer for over 50 years, GE Aviation broke ground on a new facility in South Asheville in 2013 that would be the first in the world to mass produce engine components with a breakthrough material known as ceramic matrix composite (CMC). In addition to jet engine and aircraft systems, even parts of NASA’s Voyager have been manufactured right here in Asheville by Kearfott Corporation. Part of our success in aviation manufacturing can be credited to our skilled workforce. 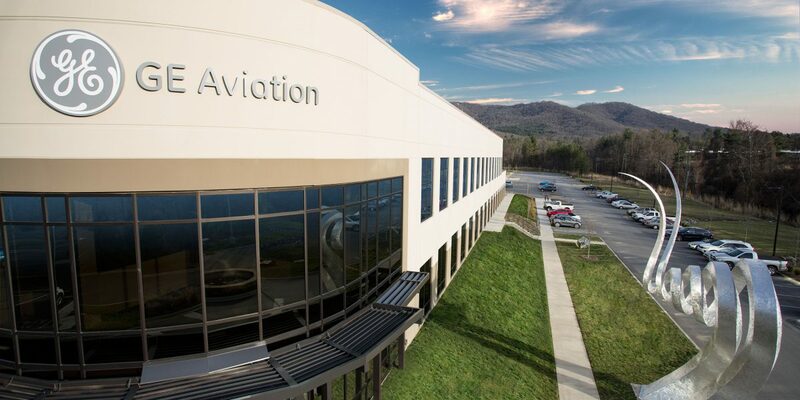 With an available and educated talent pool, aviation companies can feel confident that Buncombe County has the available resources they need to make large-scale impact. Our manufacturing progress is in overdrive thanks to our expertise with metals machining for advanced automotive components. From state-of-the-art suspensions and brakes, to Indy 500 car turbo chargers, if it runs on wheels it’s our specialty. Asheville is home to one of the world’s largest independent manufacturers of commercial vehicle axles and brake suspension solutions, as well as leading manufactures of ball bearings, full injection systems and several other parts that help make all matters of transportation vehicles dependable and efficient. It’s safe to say, Asheville isn’t just a pit stop for top automotive manufactures, but a permanent place in which they can put the pedal to the medal. What happens when you combine a legacy of craftsmanship with a community that values innovation and a love for kicking back with neighbors over a refreshing cold one? A booming beer hub with more breweries per capita than any other city in the country. What first started as a small operation in a downtown Asheville basement, Highland Brewing pioneered the way for a craft brew community which today consists of countless breweries, taprooms and bottle shops, and has attracted the likes of brewing legends, New Belgium Brewing – the fourth largest brewer of craft beer, as well as Wicked Weed Brewing, Sierra Nevada and Oskar Blues. Brewing up endless new and notable IPAs, ales and lagers is just the beginning of what this craft beer cohort can achieve. Not only are some of the nation’s best beers made in Asheville, our breweries are masters of supply chain and distribution logistics, giving a taste of Asheville to consumers far and wide that is both memorable and profitable. On top of that, our beer culture has a remarkable reputation for its collaboration and community inclusivity. It’s safe to say that Asheville brewers are proof that mixing business with the pleasure of good drinks and close company is always a good idea. In Asheville we like to keep our footprint as small as possible, and it doesn’t get any tinier than our micro-electro mechanical system operations. Asheville has a front row seat to the next generation of advanced technology manufacturing. Our MEMS workforce is skilled in precision quality microfabrication engineering components that solve today’s most complex tech problems and are disrupting the future as we know it, all at a low production cost. Asheville’s esteemed manufacturing heritage and penchant for risk-taking is a perfect storm for global companies who think astronomically big and know that the best things come in very small packages. Is it any wonder that our four seasons, temperate mountain landscape and a community of self-defined nature lovers would produce an environment primed for recreation technology and outdoor equipment innovation? More than 20 area outdoor product manufacturers draw inspiration from the plethora of outdoor activities that the Southern Appalachian Mountains offer. From Marine Corp tents to the first Bellyak craft (a prone-positon kayak), best-in-class bike components and more, recreation and outdoor companies are not only improving the way we trek, ride and play, they’re doing it from a place of pure passion for the outdoor lifestyle. Work hard, play hard? Oh yes. And we’ve got some of the best testing ground in the country to prove it.